Please review the following guidelines which are in place for the protection of the health and safety of our students. 1. Sharing of Information: Please inform the school nurse of any new medical diagnoses, especially if your child has been started on any medication on a daily basis, even at home. If I am aware, I can make sure that you aware of any side effects your child may experience during the school day. 2. Absences: Parents or guardians are required to report their child’s absence to the school each day by either leaving a message on the answering machine or by informing the office staff at 203-452-4433. In the event that the school does not receive a phone call, we will attempt to reach you on your home phone. If your child is absent for three days or longer, please send in a note with your child, on their return, stating the reason for the absence. orders regarding physical activity, please have him or her fax a note to me at 203-452-4432. 4. Medication: According to state law, I cannot administer any medication to your child in school without written authorization from both you and your physician. This includes over the counter medications such as Tylenol or ibuprofen, antibiotics, nasal sprays, eye drops and topical skin preparations. Medication authorization forms are available in my office. If you are going to give medication to your child yourself, please come to the nurse’s office and you may administer the medication in the office. If your child is taking medications at home for any ongoing medical condition, it is important that you keep me informed of this, including any changes in dosage. 1. Please bring the medication and the medication authorization form to the school nurse’s office. You may not send medication to school with your child. 2. Medication must be properly labeled with your child’s name, name of the medication, time, and amount to be given. ALL MEDICATIONS MUST BE IN THE PHARMACY LABELED CONTAINER. 3. If your child suffers from asthma or food allergies, it is strongly recommended that medication be kept in the nurse’s office to be used by your child as needed. 4. 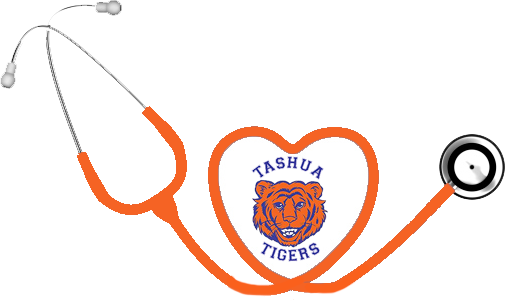 If your child is absent from school, he or she may not attend after school activities held at Tashua. Your child may not attend any extra curricular activity if they did not attend school that day. Listed below you will find the medical policies followed by the Trumbull School System to prevent the spread of communicable diseases. These policies are strictly enforced. Temperature – With a temperature of l 00 degrees or over with or without symptoms, your child must be kept home from school until 24 hours after the fever has subsided while not on fever-reducing medication, such as Tylenol or ibuprofen. Strep Throat/Scarlet Fever -Your child must be excluded from school, but may return 24 hours after antibiotic treatment has begun as long as they are fever-free. Chickenpox – Your child must be excluded for six days after the appearance of the first eruption or until all lesions are dry. Pink Eye -Your child must remain home on medication for 24 hours with no evidence of discharge from the eye or he or she may attend school with a note from the physician stating that the child is not contagious. Rashes – If your child has a questionable rash, he or she must be excluded from school and is required to have a doctor’s note to return. Please feel free to call me with any questions or concerns at 203-452-4434.